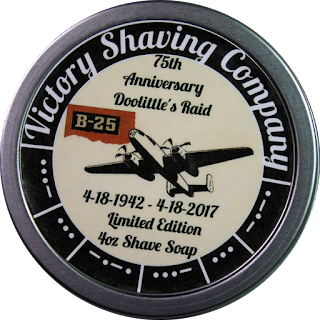 On April 18, 1942 80 brave Airmen led by Lt. Col. Jimmy Doolittle took off from the deck of the USS Hornet in (16) B-25 Mitchell Bombers on a top-secret mission more than 650 miles from their target destination which was 200 miles further away than originally planned after their discovery by a Japanese picket boat. Although the raid itself inflicted minimal strategic damage the boost to US morale following the events of Pearl Harbor and the damage to both the Japanese psyche and their war strategy were priceless. Following the raid reporters speculated and clamored for days continually asking where the planes had taken off from. In response President Franklin D. Roosevelt wittily stated that the B-25s had taken off from "Shangri-La" in reference to a fictional place as described in the 1933 novel Lost Horizon written by British author James Hilton. This shaving tin was sent to me to review by one of our wet the face community members in fact he sent a few other things along with it as well which will be part of another videos and articles in the near future. This tin is heavy gauge with a screw on top and a fantastic label of a B-25 bomber and if you look close you’ll notice a real Morse code message which does mean something so take a look into decoding it. The bottom label of this tin lets you know what number you have from the 80 tins in this limited edition run. I have tin 54. Also included is the website URL and ingredients list. Speaking of the website you should pop over to take a look at it's theme. You have two section of note the Armory where you can see and purchase the products and Mission Briefing which I encourage you to read. The scent is a blend of cherry blossom and classic sandalwood which I must say is fantastic they call it Shangri-La. Unfortunately, it’s just a tad light for me but don’t let that stop you from picking up one because the performance of this soap out ways this shortcoming. As you may already know I bowl lather and in just a little over a minute a created a creamy rich lather. The coverage was great and really penetrated my 5 day all beard. The shave had superior slickness and glide which allowed my razor to go over my face many times without irritation. The post shave feel was a good one and once I placed my Fine American Blend aftershave on it was the perfect ending. So, I had a real enjoyable shave with the 75th Anniversary Doolittle’s Raid shaving soap and if you think you’ll enjoy it too you better hurry because of its limited run and they may not have many left.